Disk image formats like ISO are quite common on the Internet in these days. Many Linux distributions are for instance are provided as ISO image downloads. ISO images are usually downloaded from the Internet and burned to CD, DVD or Blu-Ray. Burning is without doubt the most common task that is associated with iso images, but there are more. Some users create iso images on their computer system for easier distribution or backup purposes, and it is also common to extract ISO images to the system or create them for backup or distribution purposes. ISO Workshop is a free software for the Windows operating system that supports all of those tasks. The program displays options to extract, backup, convert or burn in the main interface after installation. Extract - The operation that is most likely already available on the system. Packers and archiving software can often unpack iso images as well. ISO images are extracted with ISO Workshop in the following way. It begins with the selection of a locally stored ISO image. 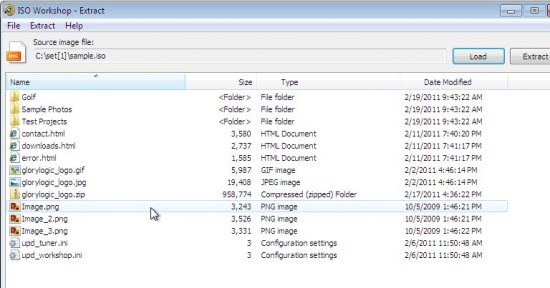 A click on Extract extracts the image and copies he files and folders to the same directory. There does not seem to be an option to change the target directory for the extraction. Backup - Can create a backup from discs that are inserted into optical drives. The program supports the creation of CD, DVD and Blu-Ray ISO images. It is however not clear if it can backup copy protected discs or only unprotected discs. The process is straightforward. The user needs to insert the disc into the drive, select an output directory and the backup button in the end. The program takes care of the rest. Convert - Offers options to convert image formats to ISO or BIN. The program supports a wide variety of image formats including nrg, img, mdf, dmg or cdi. Images that need to be converted are selected via the built-in file browser. The name of the destination image is automatically added in the process. It is still possible to make changes to that name or select a different target directory on the computer, if necessary. A click on convert starts the conversion. A conversion of a test disk format from ISO to Bin took less than 3 minutes to complete. The actual speed may differ depending on the size of the disc image and the speed of the PC. Burn - Burn should be self explanatory. The disc image needs to be selected first via the file browser. It is then possible to select one of the CD, DVD or Blu-Ray burners to burn the image to disc. The program supports disc verification and test writes. ISO Workshop offers access to several ISO-related tasks. Especially the ability to convert pretty much every other popular disc image format to ISO could be handy for users who sometimes have to work with disc formats that they cannot burn or make use of without conversion or software installation. The software program is free for personal and commercial use. Downloads are provided at the developer website over at Glorylogic. I really like CDBurnerXP. I think it gives a lot of great options.